Christopher Nolan’s Inception is one of this summers biggest blockbusters, successfully incorporating visual, emotional and intellectual elements to create a masterpiece. As I was watching Inception I was struck by the sleek style of the characters and could not help but notice the amazing timepieces strapped to their wrists. During one of the opening scenes we see a close up of Leonardo DiCaprio’s watch, the Tag Heuer Carrera model number WV211B.BA0787. This beautiful watch with a stainless steel band, black dial and diamond shaped hands has many close up shots where you can see the Tag Heuer logo and “automatic” on the rich black dial. The Tag Heuer Carrera was introduced in 1963 and designed by Jack Heuer. The Carrera was meant to have a simple yet elegant design, with only the registers and applied markers on the dial. These early Carreras were available with a variety of dials but the most popular were all-white or all-black. Many of today’s Carreras have chronograph features and have sacrificed simplicity for a more modern industrial look. The model featured in Inception is a return to the vintage Carreras of the past and complements DiCaprio’s style in the movie. Jewelry appraisal. Leonardo DiCaprio is one of Tag Heuer’s brand ambassadors and this is the reason for the Carrera making an appearance on the big screen. You don’t have to be a movie star to have the movie star look, just take a look at our website for the latest watches at the lowest prices. In the world of preowned luxury watches it is rare to come across a company who also makes cell phones. But in this case Tag Heuer is introducing the Meridiist. It is an exclusive cell phone that is only available in select cities around the country. It is made from 316L stainless steel making it incredibly durable. The fact that it is being made by Tag Heuer speaks to its sleek and sport design. It is the coolest phone I have seen on the market. The screen, like other preowned luxury watches, is made out of scratch resistant sapphire. I know because I own a Rolex that a scratch resistant sapphire crystal really does work. I have worn mine every day for years and have no scratches. While the screen has a bright 1.9 inch QVGA, the coolest part about the phone is the leather back. It comes in white, black, or brown leather. There is even an option for a black rubber back. As of today the release date is unknown. According to Tag Heuer’s website you can expect the retail to start at over 4,000 Euro. While the phone does not have all of the up-to-date technology specs it is a gorgeous conversation starter, and if you can afford it, it is worth it. Was that an exciting Monday Night Football game or what? For those of you who missed it the Saints won in thrilling fashion. The 49ers started the game about as poorly as an NFL team could. They started with the ball backed up on their side of the field and ran the ball twice with little result. Then on the third play of the game Alex Smith came out in the shotgun and said “hike”. The snapper proceeded to hike the ball 30 feet over his head and Smith had to punch the ball out of the back of the end zone for a safety. The only positive thing to take from the play is Smith had the smarts to hit it out instead of letting New Orleans recover in the end zone for a touchdown. After that horrific start and allowing the Saints to score a touchdown on their opening possession, the 49ers defense settled in. Going up against the defending champion Saints prolific offense is no easy task but they handled themselves well. With just over two minutes left in the game, Alex Smith and the underachieving 49ers offense had the ball on their own 17. They were down 14-22 and needed a touchdown and two point conversion to force overtime. Adding to their troubles, they had no time outs. Alex Smith has always been the question mark for their offense and this could be a career changing drive for him and the team. Smith kept his poise and drove down the field in just over a minute, handing the ball off to Frank Gore for the touchdown; but they still needed the two point conversion. It took a challenge by the replay booth to decide that they converted on a short pass to Vernon Davis. The fans went crazy. The only problem was there was still over a minute left on the clock, and the Saints had two time outs; and Drew Brees. The Saints drove down into 49ers territory and kicked a game winning field goal as time expired to end one of the most thrilling games I’ve ever seen. It was also exciting for our pool as only one person had San Fransisco winning the game. If they won “firehose” would have been the weekly winner. Since they didn’t, “Stevenb010” wins the Tag Heuer this week after going 12-4 this week in picks. Also, the overall standings after week 2 have “trauma228” and “busdriver” tied for first with 75 points. This is important because at the end of the season someone will win a Rolex! I’ll have my week 3 preview for you guys on Thursday along with my picks. Keep checking raymondleejewelers.net and the blog for info on the contest. Remember to tell everyone you know to join the “Sports Watch Weekly Giveaway” and make sure to specify it’s free! The “Sports Watch Weekly Giveaway” is a free contest hosted by Raymond Lee Jewelers for football fanatics and jewelry and watch connoisseurs. It is a weekly pick’em contest for NFL games. Every week for the 17 game football season Raymond Lee Jewelers is giving you the chance to win a Tag Heuer sports watch; FOR FREE! Again there is no entry fee and the retail value of the Tag Heuer sports watch is almost $1,000. The pool is run on Raymondleejewelers.net. If you are familiar with a “pick’em” league then you already know how it works, although we have a few tweaks. For those who don’t know, here are the rules: Every week you must pick who you think will win each game that week. There are anywhere from 12-16 games per week. You get 1 point for every game you pick correctly and 20 points if you pick the Monday Night Football game correctly. In order to be eligible to win the Tag Heuer you have to pick the MNF game right. For example, in week 1, bus driver won with 48 points. There were two MNF games in the first week and she picked both correctly adding up to 40 points. She also picked 8 other games correctly totaling 48 points. So, whoever has the most points each week, plus picks the MNF game correctly, wins a Tag Heuer. 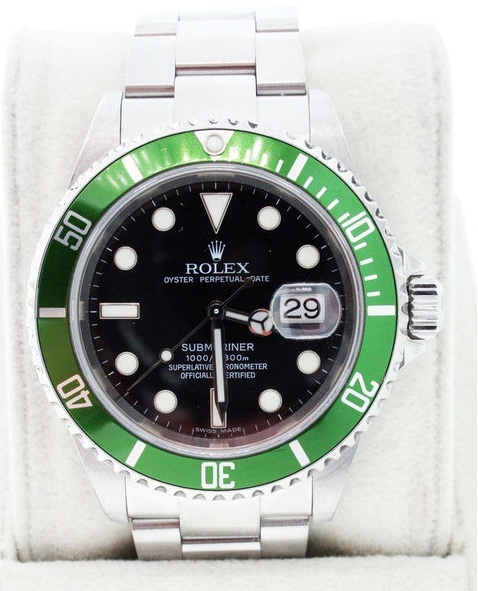 At the end of the season we are giving away a Rolex to the person with the highest point total for the whole season! What is the entry fee? How do I sign up? There is none! It is absolutely free! You do not even need to come in to the store to register. You can register right here. Just click the join tab, enter a few details about yourself, and you are free to participate. Good luck to everyone participating and hopefully we’ll see you soon to pick up your prize!